this whole wheat pizza dough recipe has the pizza dough made from 100% whole wheat which gives a soft textured pizza base with a lovely crust. take 1 teaspoon instant yeast (3 grams) in a mixing bowl or in the stand mixer bowl. add ½ teaspoon sugar and 1 cup water. mix well. next add 3 cups whole wheat flour, 1 teaspoon salt, 3 tablespoons olive oil and 1 tablespoon lemon juice..
if you do not have olive oil, use any neutral flavoured oil. attach the bowl to a stand mixer with the hook attachment. on a medium-high speed knead the dough. if kneading with hands, then mix everything very well and then knead for atleast 8 to 10 minutes. the dough should be smooth, pliable and soft. 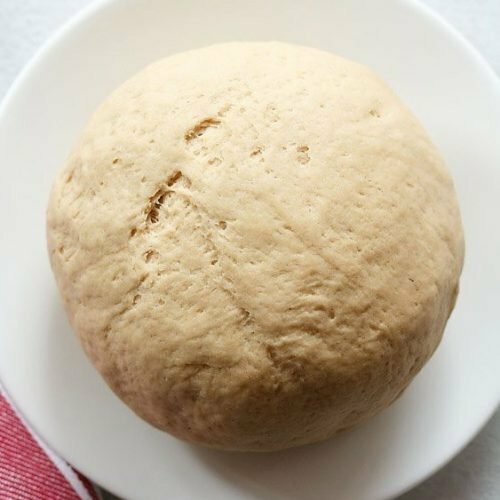 if the dough looks dry, then you can add some water while kneading. if the dough looks sticky, then you can sprinkle some flour. spread some water all over the dough. cover with a lid or a kitchen towel and allow to leaven for 45 minutes to 2 hours till the dough increases in volume and doubles up. if using dry active yeast, then keep for 2 hours to 3 hours or more. timing varies with the temperature conditions in your city. the pizza dough will nicely increase in volume and double up. knead the dough lightly again and then you can directly make pizzas from these. or you can keep them covered in a tight box or pan. spread some olive oil all over the dough before placing them in the box. cover the box or pan with a tight fitting lid. keep in refrigerator or freeze the whole wheat pizza dough. in the refrigerator this dough stays good for 4 to 5 days. in the freezer, you can store for a couple of weeks. dissolve the yeast in 1 cup warm water + ½ teaspoon sugar solution. cover the bowl and let the yeast proof for 10 to 15 minutes. the water should be warm and not on the cooler side or hot. or else the yeast solution will not get proofed or activated. when the yeast solution has become bubbly and frothy, then mix it with the whole wheat flour, olive oil, salt and lemon juice. knead to a smooth dough. spread some water or olive oil all over the dough. cover the bowl and allow the dough to leaven for 2 to 3 hours or more (depends on the temperature conditions in your city).